I love my Mango, she is my best dog friend in the world. We are inseparable at night, and I like to make sure she stays healthy. 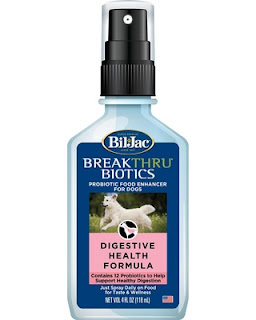 Recently we were offered the chance to try BilJac Breakthru Biotics for Dogs. I love this product because all you have to do is spray it on your dogs food and they eat it. No struggling with pills, just spray and that's it! BreakThru Biotics is a great tasting, proactive way for a pet parent to give their dog probiotics to help support digestive health. You can purchase Breakthru Biotics at most major pet stores.